The fabulous people at Lands' End contacted me recently and asked if I would like to take part in their Bloggers Style Project. Of course I said yes! I couldn't type out my reply quick enough! Lands' End asked me to choose a dress from their Autumn dress range to showcase on my blog. I have to admit it was difficult to choose. I could have gone for any of the gorgeous dresses on there. In the end, I decided to go for something with a bold pattern. I love bold patterns, I'm pretty much "known" for them. Can you guess what I chose? I went for the floral print jersey wrap dress. The customer service was excellent and my dress arrived quickly. 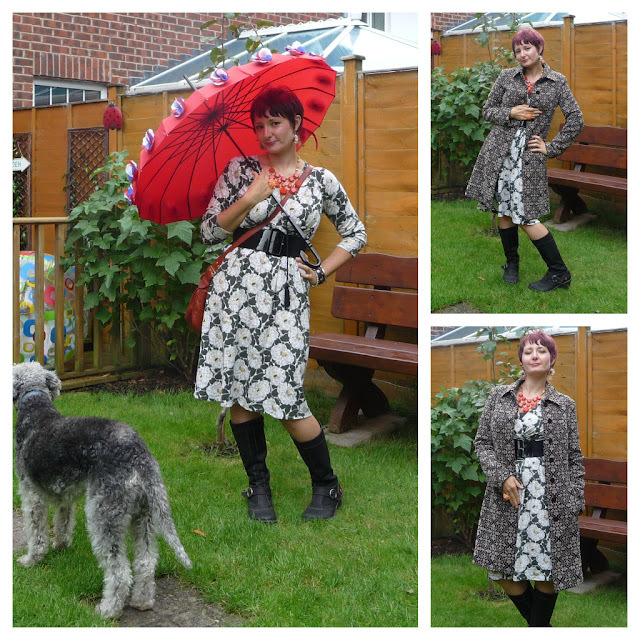 I was chomping at the bit to get to it, so it's just as well the dress arrived quickly! Once my package arrived and I opened up, I wasn't disappointed. At first look, the pattern just jumps out of you. On first touch, I fell in love. This dress is so soft and comfortable! I couldn't have been happier. The idea of this challenge was to choose a dress suitable and versatile enough to become the linchpin of a "school run" outfit. Something you would be comfortable and happy in, something you could style in different ways but a dress in which you would still be stylish. For me, this dress has all boxes ticked! It has to be said that perhaps it isn't as versatile as some of the other dresses Lands' End stock, due to it's length, shape and pattern, but I still feel you can change your look. Different shoes/boots, different jewellery, a jacket, a cardigan, a bright pair of tights for a flash of colour. I feel this dress could easily become evening wear as well. Something stylish yet comfy to wear to a dinner party in I feel! I have worn this dress several times now. I mostly team it with a pair of boots, I think that's how it looks best, though I have worn low heeled pumps and flats as well. I feel this dress really needs a belt and preferably a big one. It helps to emphasise your figure! Important when there's a whole lot of pattern going on. Talking of pattern, I love the way it contrasts with my autumn jacket and my statement jewellery works brilliantly with it. Time and time again though, I'm just bowelled over by how soft and comfy it is to wear! I've washed this dress a couple of times now. It washes well, retains it's shape, dries quickly and looks just as good as before. 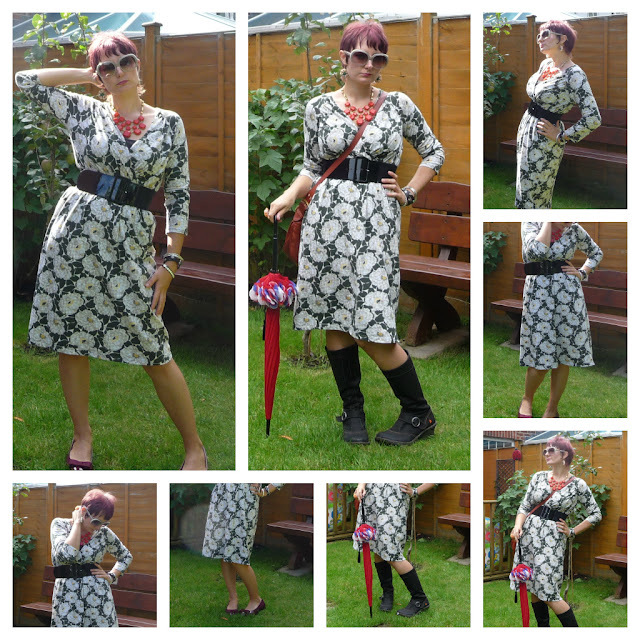 When wearing this dress, I have received compliments, particularly about the pattern! My Mum mentioned that I "looked lovely" in it. I'm very very happy with this dress - I bet that's clear now! Thank you so much, Lands' End, for involving me in this project, I've enjoyed it and can say, hand on heart, that this is a new favourite dress of mine that has already made it to the school dates twice since the start of term! If you want to see some other Lands' End dresses "in action" then check out these other bloggers! I love the dress ! If it were mine I would definitely style it with a dog. Love that dress! And paired with that statement necklace! SO CUTE! I love the shot with the red umbrella, complete with dog...he does coordinate.